What i would like to speak to you about in this blog is how to optimise your shutter speed to get the most out of the composition you are using. I will be using a couple of my own images to illustrate the points i want to get across and hopefully you will learn a thing or two. If you watch any of my vlogs or follow me on instagram then you will know that when i am shooting scenes with flowing or moving water of some sort i love to show motion and energy. I do this by using a short shutter speed, majority of the time. There are times when i use a really long shutter speed which i will explain in a minute. 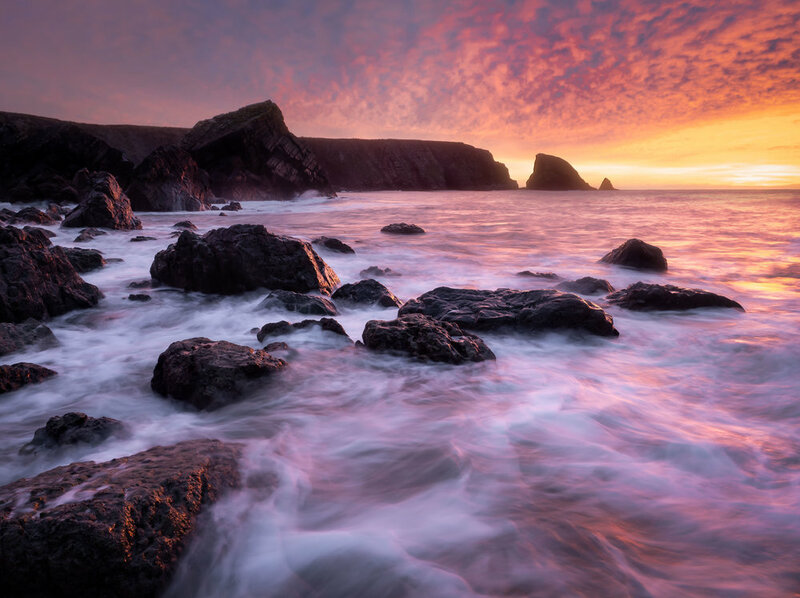 The image on the left was captured in Ballydowane Bay, Co Waterford during a beautiful sunrise. For me, what gives this image its energy and motion is the incoming wave which i captured using a shutter speed of 1/3 of a second, i had a polarising filter on to reduce the light coming into the lens to achieve this shutter speed and i shot it at an aperture of F11. Now i could have put a 4 or 6 stop filter and blurred out all that water and it still would have looked nice, however, the incoming rush of the waves give the image a sense of drama. Particularly the waves crashing off the rock in the background as it caught the light of the sky. This was in Connemara, Co Galway. I mentioned above about retaining detail and this is something i always like to do, particularly in a shot like this where i have a raging river that creates such beautiful textures and contrast as it moves and crashes over various rocks and boulders. Again, a shutter of 1/4 second was used with a polariser and 4 stop filter as it was quite bright even though it was foggy. I just think that if i had used a very long shutter speed here the effect would not have been the same. Now let me show you an image where a long shutter speed did work. As i said at the beginning, you need to learn how different compositions suit a shorter or longer shutter speed, particularly when it comes to water. This is Minard Castle in Dingle, Co Kerry. I took this image around 5:45am when the light from the full moon was still bright and lit up the scene. This gave the image an almost ethereal effect (ethereal basically means something that is other wordly, sometimes spooky). By using a long shutter speed and blurring out the water completely i added to the mood of this shot and it gave the image an elegance and balance that matched the way the moon was bathing the rocks and castle with its light. The water looks misty and murky almost like it is trying to float up the rocks in a ghostly manner. Ok maybe i am getting carried away now but you get the idea!! This was a 2 minute exposure with no filters, ISO 64 and my aperture was F8. So that is it, practice using different shutter speeds to capture different effects in the water and really think about how you can get the most out of your composition using your shutter speed. Can anyone be a photographer? Ok so i’m aware its 2019 and you have to be very politically correct in what you say and there are people getting offended if their dog looks at them sideways however this is an interesting topic and one i have wanted to discuss for a long time. So here we go. I’ll start with the question at hand: Can anyone be a photographer? In short: Yes. Long answer: Eh, it ain’t that easy. I think it depends on what you define as a ‘photographer’. Is that the professional guy selling prints, doing workshops and tutorials online? (in a landscape scenario) or is it the guy who got a camera for Christmas and is just starting out? So photography has become a sensation in recent years and it is fantastic. It is great to see people embracing the landscape and capturing memories with their cameras. There are millions of images posted online in places where people can reach them, interact with them ,study them and more than likely replicate them. And that is important! Of course you need to get inspiration from somewhere and see how others are doing it, possibly note the location and head there yourself to see what you can capture. That is all part and parcel of it (at the beginning of your photography journey of course, eventually you need to develop your own style and stop replicating everyone else, sorry if that is blunt but it’s the truth). But ask yourself this: What if there were no images online? and the only shots you saw were framed in a gallery. Would there be as many photographers? I believe that there are so many people taking up photography now that it is becoming harder and harder to find that true raw talent. What i mean by raw talent is someone who can spot a composition and who can visualise a shot using that composition in conditions that are not anywhere near present at the time of visiting the location. Raw talent involves scouting, planning and capturing a different perspective in places that are heavily photographed. Raw talent is a deep understanding of how light can dramatically alter a scene and knowing what composition would look right depending on the conditions present at the time of shooting. Creativity is paramount. Don’t light the pitch forks yet, i have copied other compositions, i have replicated images and captured the same perspective of a scene that everyone else has but that was me learning and developing my own style and exploring my ability as a photographer in the beginning, which i do recommend. It helps with confidence and you learn a lot. A small part of me does think, however, that some people are just born with a natural talent and an eye for images that cannot be learned. “you can teach anyone to drive a car but not everyone will become senna” powerful stuff and he’s a kerryman, i did not think kerry people had that insight!! So if you have gotten this far and you are a photographer, you love to capture images in whatever genre then i encourage you: Learn to understand and explore your own unique style. It will be much more rewarding. I hope to have provoked some thoughts, let me know what you think! I have gotten heaps of questions in the past few weeks about how to predict whether or not the sky is going to be colorful at sunrise and sunset and how i have gotten lucky on a number of occasions. Is it all luck? Absolutely not. Am i a weather man? No! Can you learn how to do it? yes! It is simply a case of over time i studied different weather systems and cloud heights etc and i began to see patterns. I get it wrong a lot of the time , trust me. However in this blog i will share some of the patterns i have seen, some of my tips and the apps/websites i use to help predict a decent sunrise/sunset. Now there are times when all rules and predications go out the window and out of nowhere a sky can just explode! For now, however, let’s pretend that the rules are always right and these are the tools you need to predict a good show! Right, lets jump in. Cloud Height- the most important factor! 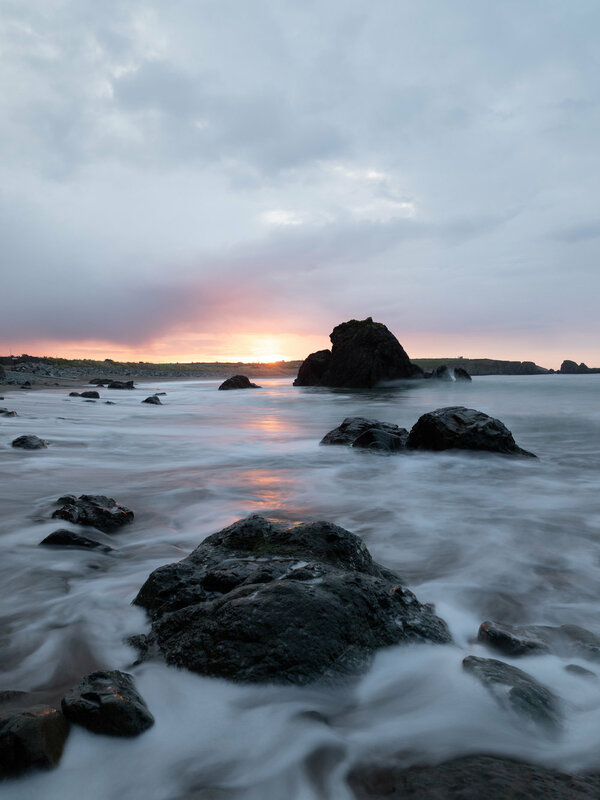 This image on the left was a sunset captured on the copper coast in Waterford. There was actually a lot of hazy low cloud present that day and i was full sure the sky would not play ball so i was shooting majority of my images with a strong foreground interest that was catching the golden light. However as the sun set i could see the horizon clear and that middle cloud just caught the light. Absolutely stunning! You can get some very nice images on a day when there is broken low and middle cloud, particularly those god rays shooting out of the clouds, this can be a spectacular sight and is definitely an opportunity to grab a shot you will remember! So do not be discouraged if you see low cloud, there is still a shot to be had , just perhaps not solely at sunrise/sunset! The image below was taken at mid day. Sunset: The best time to get that color is roughly 15-20 minutes AFTER the sun has gone below the horizon! Yes you heard me, the minute you see that sun disappear don’t you dare pack up that tripod and leave, you will regret it as i have done before and nearly cried as i was driving down the road and the sky exploded above me! After the sun has set, just wait and you will see that color come alive, for whatever reason i do not know but this is a pattern i have noticed and it is true. Sunrise: The OCT for sunrise is 20-30 minutes BEFORE the sun rises. notice the pattern? For both sunrise and sunset the OCT is when the sun is below the horizon and has not technically rose yet. Particularly for sunrises in ideal conditions the best color tends to come at least 20 minutes before the sun comes up. So it is really important to arrive on location for sunrise at least an hour before the sun is due to rise, get set up, find your composition and prepare for the show. After you have grabbed your colorful sky, there may be a shot where you can get that beautiful golden hour glow hitting a foreground subject or area so again do not pack up early, sunrise is my most favourite time to shoot. The sun on this particular morning was due rise at 8:00am. This shot was taken at 7:25am. I actually had to de-saturate this a bit, the color was so intense. The day that followed was a wet and windy day. Take Note. The above websites are my go to for getting cloud height predictions. I particularly love windy.com because of the level of detail it provides. So let me briefly show you how they work. Windy is a radar based website (also an android and ios app) which gives everything from temperature to wind to visibility to cloud cover etc. We are only concerned with cloud cover. You could go into other factors such as pressure systems and wind etc but we are not meteorologists its hard enough to get your head around this as it is! This panel is your go to. Click on the clouds tab and you will see a drop drown menu showing low cloud, visibility, fog and cloud base. Toggling through the different options will produce different images on the map this can be confusing so bear with me . When you click on the LOW CLOUD tab you are likely to see a lot of white on the screen and perhaps a yellow/mustard color over the countries. So that is the low cloud tab. Now click on the CLOUD BASE tab, you are likely to see some color on the screen, if your lucky it will be green! Green represents middle to high cloud. There is a color scale in the bottom right hand corner of the screen which illustrates the color to cloud height relationship. You can set the cloud height units in meters or feet, i leave it in feet. So now we are being presented with the actually height of the cloud base, if it is green it would be ranging from anything between 10,000 and 25,000 feet. Middle cloud is generally 4-6000 feet, from what i have observed anyways. Next, click on your cloud base and see if there is middle to high cloud present over that area. If its green your good to go! after that it is hope for the best! I find windy quite accurate, it has gotten it wrong at times but that is to be expected. No device or computer can 100% predict what mother nature is going to do. So we are looking at 7400 feet. Middle cloud, that is good and the possibility of some nice light catching the underneath of those clouds at sunset. And that is it, you make a decision based on this information from windy.com. Next click on the HOUR BY HOUR tab. This will bring you into an hourly breakdown of the weather. From there you are going to click on DETAILED. Scroll down to the time of sunset and check the cloud cover. I use Yr in conjunction with windy, i find windy the more accurate but when the two of them are singing off the same hymn sheet then generally they are correct! So those are the two apps/websites i use for my predictions. The windy app is good to use on a mobile device, the Yr app does not seem to give the cloud percentages for some reason so just go onto your mobile browser and access the website that way, just might be hard to see on a small screen! Are these sites always right? of course not. But it is an excellent place to start. I am going to finish up this blog with a couple of observations i have made simply by experiencing various sunrises and sunsets and weather systems. Pay attention to the weather! I assume you have heard of the saying “Red sky at night, sheppard’s delight. Red sky in the morning, sheppard’s warning”, that is incredibly accurate! If you are out for sunset and the next day is given dry and fine, with the optimum cloud height, you will be in for a show. This was arguably the best sunset of that scorching summer we got in 2018 and luckily i was there to capture it. The next day was again roasting hot, which i think was the reason for this fantastic color in the sky. This was looking across to the blaskets from Dunquin Pier in Co Kerry. My favourite time to shoot is sunrise. You generally have the location to yourself and in my experience the best color has come at sunrise. Maybe that is because i live in Ireland and we get a lot of rainy weather! Anyone who tells you that you are always lucky to capture colorful skies and that the weather must love you, politely tell them you take the time and effort to study the patterns in the weather, cloud height and that it is YOU who puts yourself in the right place at the right time, with a little bit of luck ;-). This was the end of a day filled with gale force winds, hail, thunder and rain showers! Often times , after a day of rain and the light breaks through you can get some fantastic contrast and color in the sky. I think it has something to do with the barometric pressure in the atmosphere and the moisture in the air (i could be completely wrong there!). A day of broken cloud, showers and sunshine can be some of my favourite conditions to photograph in with rainbows and storm clouds offering a totally new element to photograph and some fantastically dramatic images! So don’t be put off by the not so ideal cloud conditions, this blog is solely focusing on sunrise and sunset! So that is it folks, i think i have covered everything i wanted to cover. I hope it was not too confusing and that you have learned a thing or two about using cloud height and weather to predict a decent sunrise/sunset. Please do not hesitate to drop me a question in the comments or contact me through email/social media etc. I have covered this topic in an upcoming vlog also so stay tuned for that on my youtube. I would love to see the sunrises/sunsets you capture using this information so send them on via DM on Instagram! In February 2018, i sold my Nikon D750, Nikon lenses and bought an Olympus OMD Em10 Mkiii. I soon after wrote a review of this camera discussing my experiences with it. Soon after i purchased the Olympus OMD Em1 and Em1 Mk2. Spoiler: The mk2 is a beast! I feel now it is sufficient to write about my overall experience using olympus equipment. In my camera bag you will find two Olympus Bodies, an Em1 and an Em1 MK2 along with a 45mm f1.8 prime lens and the Mzuiko 12-40 F2.8 Pro lens. Firstly the build quality on my olympus bodies is very impressive, particularly with the Em1 Mk2. It feels far sturdier in the hand than my D750 did and it weighs much less! It’s hard to explain but with the vast number of controls and features on the Em1 Mk2 you really feel in control when taking the shot and almost like you can manipulate the image in whatever way you want. The automatic magnification when you pull back the focus clutch along with the clear red focus peaking make manually focusing a breeze. The olympus menu systems took a bit of getting used to and i still have not fully gotten to grips with them as there is so much customisation with this camera, which can be very beneficial especially for setting custom shooting modes. The grip on the Em1 Mk2 is deep and makes holding the camera with one hand a dream, your fingers fit nice and snug into the grip and provides very good comfort and stability. The rear LCD screen is touch and allows you to scroll and zoom into shots to check their sharpness while out shooting. I can safely say that i will never go back to an Optical view finder after using an Electronic one (EVF). The back buttons on the Em1 were poor and did not respond well however thankfully Olympus seemed to fix this with the Mk2 as buttons are now tactile and respond well to push. The EM1 Mk2 with the 12-40 f2.8 attached looks pretty cool, it’s shiney black aluminum body gives it a certain class and mean look which i really like. No part of the camera feels plasticky or cheap, which couldn’t be said for some of my previous gear. I have seen no major drawbacks from going from a full frame sensor to a micro four thirds sensor and i think there is great credit due to olympus for this. I have printed big, shot astrophotography and have been using the Em1 MK2 as a landscape photography camera for the past 8 months, it does not seem to be used much for fine art landscape work, instead for portraits, street photography and wildlife but it has served me extremely well for my landscape work. High ISO performance is poorer than on the nikon D750, which was to be expected as you are shooting with a sensor half the size but i rarely shoot at high ISO’s so this is not an issue. Images have been crisp and sharp and the camera produces excellent colors and a surprisingly impressive dynamic range for such a small sensor. I use luminosity masks and exposure blend in 80% of my work so dynamic range isn’t a huge issue for me but it is still quite impressive. The Mzuiko 12-40 F2.8 pro lens has taken 90% of the images for me this year and i can safely say i would buy another one again in the morning were anything to happen. It is a workhorse, built splash and freeze proof and i can stand by this as i it has often got caught in a shower of rain and not a problem was seen. It handles the elements like a beast. The pull back clutch system is a joy to use and one my favorite features is the programmable FN button on the lens which i have set to change my ISO quickly out in the field. I don’t shoot wildlife but i hope to get involved in more next year. However i know that the 18fps on the Em1 Mk2 will certainly help me in that regard! And a whopping 60fps with electronic shutter. That is crazy! The OMD cameras have excellent 5 axis stabilisation. I have gotten sharp shots handheld down to 1 second shutter speed. Now majority of the time i have my tripod with me but it is handy to have this trick up its sleeve, particularly for shooting video. Previously i would need a gimbal to get steady handheld shots but i can achieve this now with the IBIS. Their is a high res mode where the camera can shoot a staggering 80 megapixel raw file. Gimmick? Maybe but its pretty cool! I don’t use it much as i think that many megapixels is overkill unless your are really cropping tight into the image and the scene has to be incredibly still. I do a lot of hiking so the lightweight system is a pleasure to carry in my backpack, i imagine this is the same across all the m43 range of cameras. Autofocus is reliable. I have found when shooting video at times it struggles with focus and goes hunting while in continuous auto focus but i think i need more practice shooting video with these cameras. I generally have the 12-40 on my Em1 Mk2 and the 40-150R lens on the Em1 for shooting telephoto shots. This is a cheap lens with a max aperture of F5.6 at the 150mm end, however it has served me fine and i have gotten some decent shots with it. I want to try the 40-150 F2.8 pro lens, it looks like a beast and i’ve seen some tack sharp shots produced! I use luminosity masks in a lot of my workflow so i blend exposures a lot however i shot a wedding during the summer with my olympus cameras and it was during bright harsh sunlight in America and i felt the camera handled it quite well. I was able to pull back highlights in post and raising shadows does not introduce a terrible amount of noise. Obviously it is a micro four thirds sensor so it will not have the same dynamic range as the big full frame sensors but my mate has a Fuji X-T2 (an APS-C sensor) and i have seen no clear difference between the dynamic range on his fuji and my olympus when we are shooting side by side. There is very little i don’t like about these cameras. One thing i did notice was the autofocus when shooting video was sometimes a bit hit or miss. While i don’t shoot much video this is just an observation i had. High ISO’s do show a lot of noise but it is fine grain and can be dealt with in post easily enough. Initially i found it difficult to find a remote shutter release as the Em1 Mk2 uses a 2.5mm heaadphone jack as the socket which is also what some canon and fuji cameras use. I am using a canon one and it works just fine. Battery life is quite good but im not sure why spare batteries need to be so expensive, surely 80 euro is a bit much for one battery? Anyway as a whole there is very little i dislike about these cameras and i dont have many negative experiences shooting with them over the past 8 months. It seems that my switch to Olympus has aligned with my passion for photography igniting and perhaps any camera gear i would have bought in the last 8 months i would have been impressed with as i have become hooked on landscape photography. However i think the benefits of the olympus system along with the lightweight compact set up which has made hiking and travelling easier has made photography more accessible and enjoyable for me. The camera’s are enjoyable to use they feel worthy of the price they are. I think i’ll be sticking with Olympus for the foreseeable future..
Have you ever seen the sun pass through the sea arch at Nun’s Beach, Ballybunion? Like a scene from Sleepy Hollow! I posted this shot to my Instagram last night and what i was amazed by were the amount of people who messaged me asking how to photograph in dull and misty conditions and that they would never have ventured out on a day like that. I love foggy/misty conditions, i think often people mix them up with dull, damp, grey conditions. There is a difference and it often has to do with the cloud. An overcast day can be very boring for photography, thick grey cloud with no texture in them produces flat boring light. However yesterday when i shot this image there was fog and some mist, as you can see behind the cottage. This gave the image atmosphere and mood which matched the deep tones of the brown grass and flowing water. Mood ties in with atmosphere but moody conditions are often those dark tones that almost make the image look sinister. Moody photography is something a lot of people specialise in and they do very well. If you want to shoot moodier images look for dark shadows, strong contrast in the shot and layers to give the image depth. I think a lot of people shy away from these conditions because they are miserable looking, a lot of the time! But for photographers they can produce some of the most rewarding images because you need to really think about your composition. You need to pick a composition and basically tailor your shot to suit the weather. The above image would not look half as impressive without the fog in the background, the scene as a whole is quite nice with the cottage as a focal point and the river providing a leading line to that but the mist and fog just gave it that extra umph! So where do i go next time i see misty foggy conditions? Well there are a couple of things to consider and know about when fog may form. I’ll start with this, if you live near hills/woodlands and you see them shrouded in cloud there is a good chance of mist surrounding the trees/woods. If the cloud is hanging low and the conditions are damp then hopefully you will get mist as you walk through the woods. I shot these woodlands on Xmas Eve, i could not see the hills in front of me as i left home but i was hopeful it would settle among the trees, and luckily it did. I was imagining a scene from sleepy hollow! But how do i Know when it will be foggy? Bear with me for this next part, we get a bit scientific! You will often see fog rise from Lakes/fields on those cold clear mornings as the sun comes up in Autumn. Fog is essentially water present in the air condensing to form this mist/fog we see. In a nutshell, fog is formed where there is a temperature difference between the ground and the air. This is why you often see those foggy mornings in autumn. 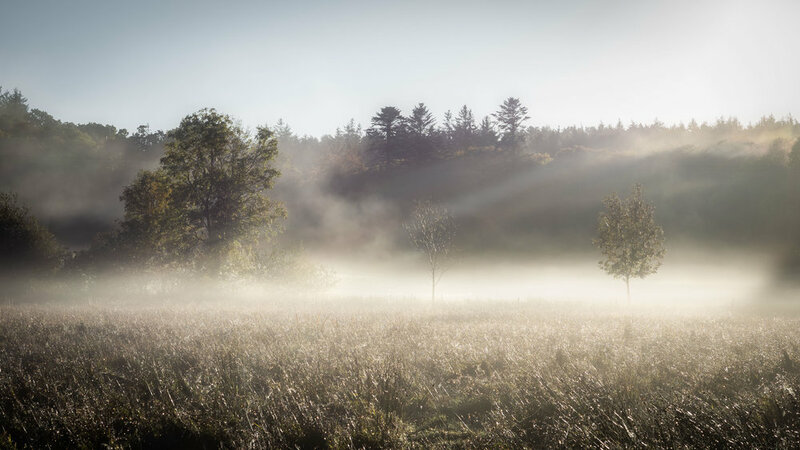 The ground has absorbed all the heat over the summer months and now when temperatures start to drop this warm ground collides with the cooler air temperature causing fog to form. Notice above i mentioned Clear mornings, if there is cloud present this insulates the earth hence the temperatures do not drop much however on clear mornings (by clear i mean little to no cloud cover) the air temperature will drop. Also when using websites like Yr.no they give you the humidity measurement, if humidity is high and there are clear skies given with cold temperatures, head out that morning! Fog also forms over hills and valleys, often this is low hanging cloud too. Whatever the case these are some of my favorite conditions to photograph and should be for you too! Obviously there is a lot of luck involved too but effort is always rewarded remember that. If it doesn’t go well the first time, try again! You may have heard of a cloud inversion. These are often shot from Mountain tops and are pretty cool. I have never shot a cloud inversion per say however i do know that to get a cloud inversion you need to have very low lying cloud and nothing else. No middle or high cloud. So if you get Low lying cloud and hike up to the top of a mountain like Brandon or Carrauntoohill then you may witness a sight very special! So i hope that helps anyone with shooting in foggy/misty conditions and where possibly to head to get a nice shot. Stay safe! Instagram and Social Media- Where do your priorities lie? This time last year i had roughly posted 20 pictures on Instagram in 2017 and i had 700 followers. I just recently passed the 4k mark, in the space of 10 months. How did this make me feel? I did not feel the way i thought i would. There was a hollowness there that i did not expect and i pinpointed this hollowness to my recent lack of confidence in my images and overall inspiration which means i have no images coming up that I’m excited to post on instagram. So it got me thinking. I love photography- or do i? Do i love photography or do i love the buzz of seeing the likes roll in on social media and the shares followed by the features on a couple of hubs throughout Instagram. Another thing, if i go out exploring somewhere to a new location and i miss out on a good photo by either being late or not finding a nice composition etc i get a bit p%#sed off with myself and my evening/day is ruined. Now i’m beginning to see an issue. When your passion for photography is affecting your happiness and causing your day to be ruined, then that’s a problem. But surely you would say “sure there will be plenty of other opportunities down the line?” and yes of course there will be. The sun will always rise and always set again the next day but when you are stuck in this lifestyle of social media and Instagram you feel almost pressure to get a shot because you haven’t posted in over a week and what are your followers going to think? Oh no we can’t lose our followers that is detrimental! This is the issue and i 100% guilty of this. Putting up a shout-out story every-time you get a feature, i do it all the time but why? Majority of people in the Irish photography scene will have seen the image on the hub or feature page anyway, why be reminded of it when they see my story? So ill ask you reading this, Would you get the same buzz out of photography and taking images if there was no Instagram to show them off? Honestly, i can say i probably wouldn’t, maybe a year ago i did but it wasn’t until i went to Iceland in January 2018 that i got hooked on landscape photography. To a certain degree Instagram is the place where you can show your images to the world and be proud of them, it is an achievement and something that your hard work and effort deserves and there is absolutely nothing wrong with this. I have made some fantastic friends through Instagram, met some great people and i would not be where i am today without Instagram. Social media can be a fantastic addition and tool to peoples lives, when it is used correctly and in a healthy way. In terms of photography, I want people to see my images. I don’t get up at 3am and drive two hours to get a sunrise for the image to be gathering dust on my hard drive, I want people to see it and appreciate it. The same way an athlete wins a medal for hard work and training, photographers show off their images and receive praise in return, maybe a purchase of a print for someone’s wall etc and this is fine. But the passion for the hobby needs to be there, the gra (irish for love), the appreciation of just being out in the fresh air and outdoors, getting exercise and possibly enjoying the company of someone else regardless of whether you get an image or not. For someone running a business and they are using Instagram as a marketing tool that is somewhat different, I’m speaking here on behalf of the hobbyist and amateur photographers. For you as a photographer, is getting an image to post on Instagram more important than the hobby itself? Is a day out exploring with your partner or by yourself or family/friends etc a good day if you come back with nice images and a bad day if you don’t or you miss a photo opportunity? I know i’m not alone and many people probably feel similar but they do not realise it because they are stuck in the whirlwind of double tapping and scrolling everyday, stories, comments, Dm’s, living in other peoples worlds, envy, jealousy etc these are all prominent in photography today and life in general and unfortunately i put it down to overuse of social media. Photography is a fantastic hobby. You get out in the fresh air, you get some exercise, you see some of the most spectacular scenery and sights and witness some stunning sunsets/sunrises which a lot of people may never see. It takes you all over the country and all over the world and it helps your creativity flourish. It can make a big positive change to your life and showing your images and getting positive reinforcement for those images can be a fantastic thing, once a balance is struck between being out enjoying the process and posting on Instagram to get likes, shares and follows with the weighting of that balance being more in the favor of being outdoors and enjoying the photography process itself. One of Instagram’s founding member’s , Bailey Richardson, recently left the platform, for similar reasons to what i’m eluding to above but i think she really summed it up when she said “I feel like we’re all addicted to a drug that doesn’t get us high anymore”. That personal touch Instagram used to have is gone, now it’s hard to know if your content is really being valued and appreciated or is it just another cog in the machine. I am not bashing Instagram or social media i am just giving you some food for thought because everyday now you are hearing of young people in particular having mental health issues because of social media and other problems being caused by it, i do not think Instagram and social media deserves such a bad rep because there is a lot of positives to it and the young people that use it have done some marvelous things through social media. Now before people jump to conclusions, i am not quitting Instagram. I love Instagram, i love showing my images to the world because a lot of hard work and effort goes into them. I am learning from other photographer’s through the platform, i am building positive relationships and friendships and while we all like to think we are different and creative, I do get inspiration from other photographer’s shots. I am so grateful to everyone that takes the time to comment on my posts, send me a DM, shares my shots and even gives the photo a like. Also to those who followed me and continue to do so, thank you. I am continuing to grow and learn as a photographer and i do not know how many followers i will have this time next year or where Instagram will be. What i do know is i will still be capturing images and working to better myself as a photographer. I think i need to go back to day one when i got hooked on landscape photography and that feeling in your gut when you see the image appear through the viewfinder, it is something photographers can relate to but it is special. Do not gauge your progress as a photographer through the amount of followers you have or the number of features/reposts/shares you get on Insta. Be proud of your images and take constructive criticism when it comes, do not envy others for their success only be willing to learn from them. Focus on your game, enjoy the process of creating an image, it is much more than just simply pressing a shutter button on a camera, it is art. Do not let social media bring negativity into your life or hobby, it is there to be enjoyed and when appropriate used to show off your works of art but do not let that + button at the bottom of your screen become priority. Stay tuned in to what’s important in life and look after yourself. Anyway, i’m off to shoot sunset, anyone coming? As all you photographers know, and many non photographers also, we post process our images. This means that when we go out and take photos we edit them in a photo editing software afterwards. Adobe photoshop and lightroom are the big guns in this field. But are we as photographers cheating? Is photo manipulation cheating? I have often been asked this by people observing my images or those starting out in photography who try to get the same shot and fail, when i tell them the difference is often in the post processing. Photo editing software is a tool, the same as a carpenter uses a saw, the same as a plumber uses a wrench, the same as a teacher uses a textbook. It is a tool needed for us to complete the job and anyone who tries to tell you that we are 'cheating' when we use software to make our images come to life is talking total nonsense because every single image you have ever seen and went "wow that's stunning" has been processed after being shot. Now that is not to say that you can go out with the camera and start firing blindly expecting to create loads of wow shots in Photoshop, no it doesn't work like that. You still need those fundamentals of photography such as composition and lighting and framing a subject etc. But when editing software is used in conjunction with these fundamentals that is when you start upping your game. We need to learn how to post process the same as we learned how to use a camera. I use Adobe Lightroom primarily because it is an excellent system for organising my images as well as being a powerful editing tool. I use photoshop when i need to do some exposure blending, or more complex adjustments that lightroom can't quite do. So if you find your images lacking something but you know your doing everything right on location then it might be your post processing. DISCLAIMER: I am not nor do I pretend to be an expert at Photoshop, I have a lot to learn yet! 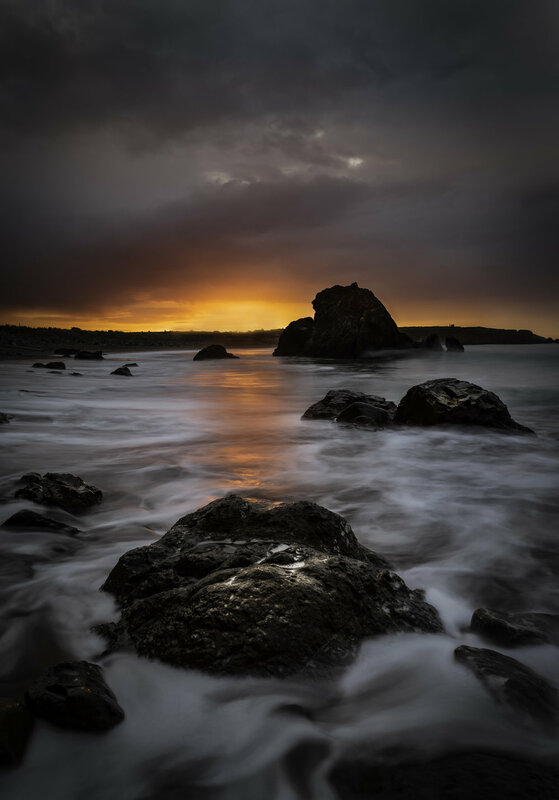 This is an image i took on the copper coast near Waterford. I wasn't even going to get out of the car that morning it was so dull and the cloud was thick but this can often create a different type of shot. Anyway, as the sun was rising i was not able to expose for both the foreground and sky in one shot. Hence i took two images and blended them together in photoshop. This is my sky exposure. I reduced the exposure to get rid of the blown out highlights and bring some contrast back into the sky. This is my foreground exposure. I also focused on the rock directly in front of me . Shot at F5.6. Even this is probably a tad underexposed. As you can see both these images are nothing special, yet. But combining them together i was able to bring back the dynamic range and create a photo that i was pleased with. On top of other colour correction adjustments, some contrast, clarity etc done in lightroom the primary editing was done in photoshop by blending the two images using layer masks. Did i cheat? No, i used the tools i had at my disposal to do the best job possible. I'm also not trying to say my images and post processing techniques are fantastic and everybody should do the same. I'm simply giving an insight into why we use post processing in our images and that there is a lot more work in photography than just looking through the viewfinder and pressing a button. Any questions, comments, rants, feel free to send me an email, message me on instagram or comment below. And if you completely disagree with what i'm saying and think i'm talking utter nonsense then i would love to chat with you :-) Once again thanks for reading and talk soon. 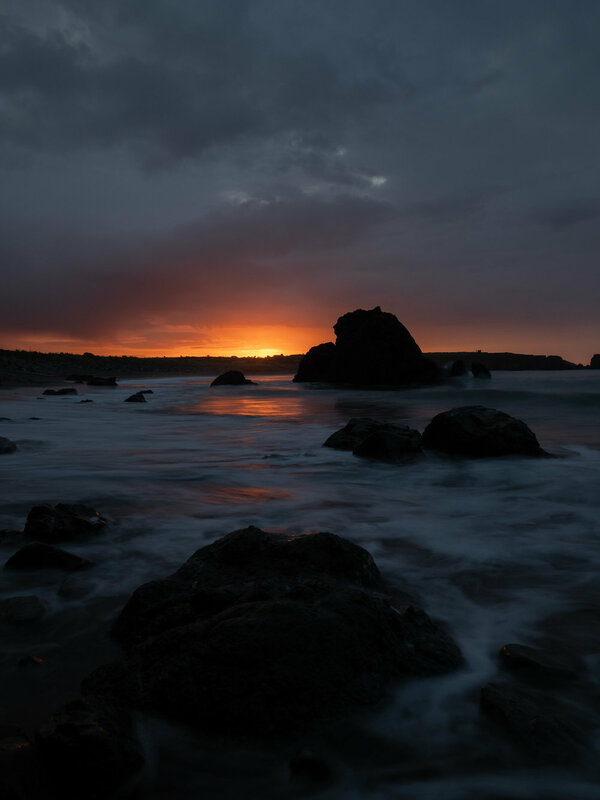 Landscape Photography- Don't forget to enjoy the Landscape! If you are like me when out taking photos, generally you will be running and racing trying to find the right composition before the sun sets/rises. This is wrong, do not do this! and in recent years i have gotten better. I have learned to plan my shots more so i know what i am going shooting, as well as checking the time of sunrise/sunset plus what direction it will set/rise in (photopills app). However, one thing i often forget to do in the midst of all the planning, shooting, angles, filters, hoods etc is to actually just enjoy the landscape. There has been so many times when i have done a shoot at sunset, got my shots, packed up and went back to the car. Then when driving home i'm thinking i didn't even sit back and watch the sunset. Is that possible? You photographed the sunset but did not watch it? Yes it's possible and i have done it countless times. So enjoy being out, enjoy the landscape and don't rush around with the camera just to get a shot and pack up and go after you taking the time to travel to the location and make the effort to find a nice spot. I'm not going to drag this one out, keeping it short and sweet. As above the one thing you need to be considering in your photography, more so for landscapes: Depth. By depth i mean drawing the viewer into the image. Creating depth in your shots really makes them stand out from the crowd and creates that immersive 3D effect. These two images are good examples because they show nice symmetry in the Center of the frame. Particularly in the road shot you can see the lines going off to infinity. As ye can see, i like rocks and water! But rocks make a great foreground subject. Trees, roads, cliffs, buildings they can all be framed right and used for a foreground. 3) This is a general rule you'll see pop up a lot on landscape photography articles and guides online: Shoot at golden hour. Golden hour being either sunrise or sunset. Why? The light is soft, there is more colour in the sky (if conditions suit) and you don't get those harsh shadows caused by the glaring sun in the middle of the day. A lot of people see a crystal clear sky and think this will be a stunning sunset, while it will be clear and beautiful, the most vibrant and surreal skies i have seen have had some cloud in them. When the clouds are high in the sky, you will get a good sunset/sunrise. Also often after a day of rain if the weather clears there is a stunning sunset, likewise if you look at the forecast and see reasonably clear conditions but rain forecast for the evening then get out for sunrise! This is a winter sunset from Glencar Lake, Co Leitrim. The following day was the most miserable, wet bucketing down irish day you could imagine. I am not a meteorologist, i'm just sharing what i have experienced and what seems to happen regularly. So don't be disheartened if you see poor weather, take the chance, you never know what might happen! So that's it, quick little tips about landscape shots. I didn't go into the camera settings or gear used for landscape photography (Narrow aperture, Tripod maybe, wide angle lens (not always), patience, the tea and sandwiches etc. That can be for a different time, its fairly well covered across the internet spectrum anyway. It has always been a dream to visit Iceland, long before i got into photography. The land of ice and fire has this draw that nowhere else in the world has, for me anyway. This desire to visit iceland was not helped by my obsession with the Aurora Borealis, commonly known as The Northern Lights. And i got to see them, just..
15th of January 2018 me, my girlfriend and another couple headed off from Dublin Airport to Reykjavik via Wow air. Side Note: i would fly with them again no problem. Planes were comfortable, very clean (cough ryanair) and staff were pleasant. When we landed in Iceland it was a quick process from being picked up by the rental car service, getting our dascia duster and heading into Reykjavik to find out apartment. Our apartment was in central Reykjavik and just what we needed. Very clean, easy free parking outside and the host was superb. Now i wont bore you with all that sort of stuff, yes iceland is expensive, yes main course and drink could cost you over 30 euro but so what! If you are planning on coming to Iceland but afraid to spend some money then you might want to re-consider. Plus you can do it reasonably cheap. We had an apartment meaning we had cooking facilities and going to the local supermarket instead of eating out everynight saved us a lot of money! 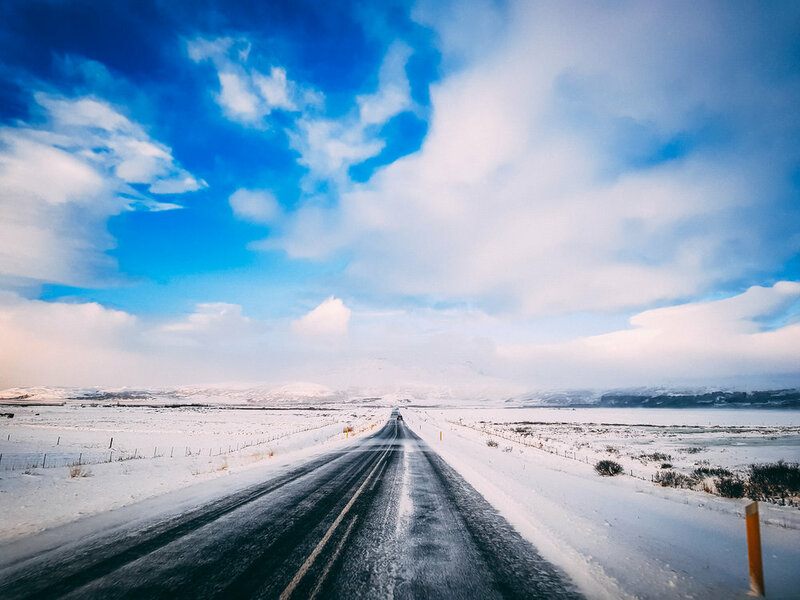 In january, driving in iceland is generally not for the faint hearted. They drive on the right hand side of the road (as opposed to us on the left hand side here in ireland) and icy/snowy conditions are regular most days. 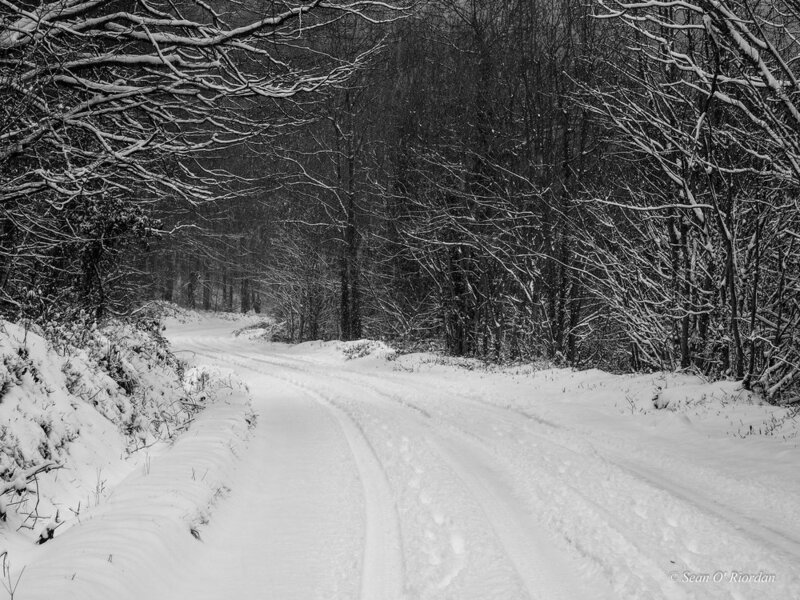 However, most roads are well cleared and gritted as the country does not stop for the weather they carry on as normal. Our jeep had snow tyres and plenty of grip! Diesel is quite dear surprise surprise. I think we travelled well over 2000km in the 5 days we were there. It wasn't as you would call it a very relaxing holiday! Well it was, it was exactly my kind of holiday but other people may not see getting up at 5:30am most mornings and hiking in wind and snow relaxing! But i am a photographer and as photographers know the best time to shoot is at sunrise and sunset. So we might of had a 2 or even 3 hour drive to a location for sunrise hence you have to leave early. Oh yes, daylight hours in iceland in winter are short. The sun rose roughly around 10-10:30am and set at 3:30-4:00pm. So you had to make the most of them! We visited the black sand beach in Vik which was also pretty cool and mostly deserted which i loved. Skogafoss was quite crowded with tourists even though winter is actually off season in Iceland. Why do they call it the black sand beach? you guessed it, the sand is black! No marks for pointing out the obvious but it is very cool to see and the surrounding landscape is surreal. we visited kirkjufell, possibly the most photographed mountain in Iceland! This is situated in a nice little town where we ate margarita pizza in a small corner cafe, why is it always the small tiny restaurants that do the best food? Anyways we were at kirkjufell for sunset. This was quite a drive from Reykjavik though so make sure you are not tired driving to and from there. Stopping to take in the landscape is a great way to get some fresh air and stretch the legs. 3) Have a plan. You only have 5-6 hours of daylight. Trust me, you do not want to be spending two of those hours deciding where to go then spending another hour in the car. You leave when it’s dark outside and arrive at destination for sunrise. Have each day planned out with routes, travel times, what you want to see etc. 5) if your traveling in winter have plenty of layers. The wind chill can be quite cold. Now I am not a cold person I quite like the cold but I will never forget our first morning in Gulfoss waterfall I thought my hands would fall off. I was hardly able to remove the camera from the tripod! Good sturdy walking shoes are helpful too with warm socks. Want to see the Northern Lights? Check the KP index. The KP is basically how they measure the aurora activity ranging from 1-9 with 1 being the lowest and 9 being a mad solar storm that rarely ever happens. You also need a clear sky, which you Astro photographers reading this will know. When I saw the lights the KP index was a mere 1 yet they were still dancing across the clear sky. It was our last night in Iceland and every night previous the cloud has thickened and so with it vanished our chances of seeing the lights. I was beginning to get disheartened when I found this secluded spot near a lighthouse on our last day and I knew if that night the sky was clear we’d see them. Sure enough with us due to drop the car back at the rental for 4:30am , at 2:30am we were standing on the coast line staring up at the green lights flickering overheard and what a sight it was. 4) wind open that aperture on your lens and watch the magic happen!! (Obviously there’s more to the technical side of shooting the northern lights than that but plenty of those articles online). I thinks thats it. I know I have skipped loads and forgotten to add in stuff but I don’t like long pieces and if you have gotten this far even FairPlay and thanks for reading! In the past few weeks i have had a number of people asking me the above question. "I'm looking to get into photography just as a hobby or nice pastime and what camera do you think i should buy?" And my answer is always the same "There is a number of factors to consider and no same camera is right for everyone". Firstly i am delighted when someone tells me they are looking into photography because it is a fantastic pastime that takes you to many places and moments. And it's a hobby that i think is becoming more and more popular partly due to the affordability of cameras in comparison to previous years. This article is going to outline only a few options for you starting out as a photographer because the amount of options available now can be daunting and as a beginner you may find it tough to decide. So I will try narrow it down for you. Have you decided on a brand? I am aiming this question at people who perhaps have a preference for nikon or canon. Being honest, for every canon dslr out there nikon has an equivilant and vice versa and i would be more focused on putting time to learn photography and read up on it rather than ponder over Nikon vs Canon because both brands produce excellent cameras with a good range of lenses available. So don't waste your time googling 'Nikon Vs Canon' i will outline options for both brands in this piece and you can decide. I imagine this is high up on your list of things to consider and you would be right. Now before you get scared that i'm going to start throwing a load of numbers at you that will make you re-think your whole financial situation, i am not. However what i am going to do is list some sample budgets and what you can get for the price. Bear in mind these prices are new, you can easily pick up excellent copies second hand on ebay or adverts or your local site for significant discounts but being a beginner id imagine you'd rather buy new. Both these cameras are capable of excellent images, the nikon having the higher megapixel count of 24mp in comparison with the content. But please dont get hung up on megapixels, unless your are printing massive prints megapixels is not the be all to end all. Anything from 16mp onwards will be more than adequate. The lenses are kit lens, only called kit lenses because their bundled with the camera as part of a 'kit'. Originality at its finest. Now you will see some people online bashing kit lenses. Trust me if you are starting out in photography you are not wondering about ED Glass or how many elements it has or maximum aperture etc you want to buy a camera, take it out of the box and start shooting. That is exactly what you can do with a kit. Worry about becoming a pro afterwards and when the pocket is a bit deeper. 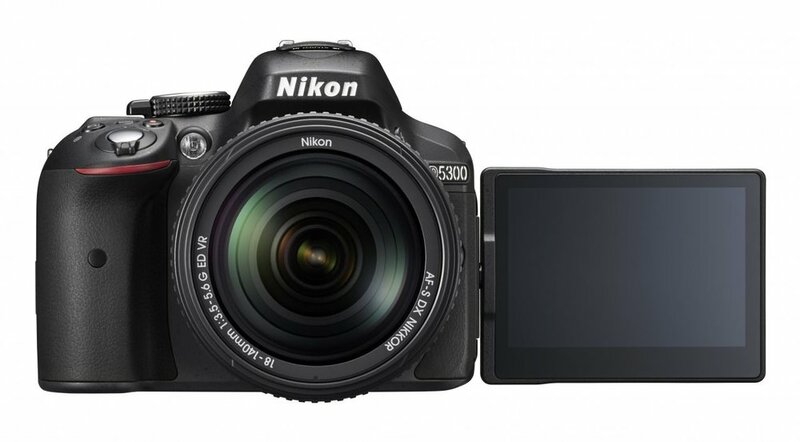 If you like shooting video you might swing for the Nikon as it shoots 1080p at 60fps in comparison to 30fps on the canon. The Nikon also lacks an Anti Alias Filter, basically you get sharper images in theory (in real world performance its often hard to tell!). Ok i'm gonna leave this bracket at the D7000, hands down fantastic camera. Now it has been replaced by the D7100, D7200 and D7500 since. You could pick up a used D7200 for between 6 and 700 euro. But the D7000 can be got new with an 18-105mm lens for around 680 new. I had this camera before i went to the D7200 and it was stellar. Excellent image quality, noise performace was fantastic and it really felt a substantial camera in hand compared to my D3200. It has a 16mp APS-C sensor, shoots 6fps and has 39 focus points . If you have the budget look into one of the D7000 series from Nikon with a Sigma 18-35 F/1.8 lens, killer landscape photography combo! Now feel free to shop around, I am just using amazon links here for convenience purposes, you can find many good deals online from various retailers and If you have a friend who can source a good second hand deal for you and who knows what to look out for in buying second hand gear then by all means go for that because I have purchased a lot of second hand photography gear in the past which has been near mint and at a substantial discount. Adverts.ie here in Ireland is an excellent source of second hand gear. So all the cameras I have listed here are crop sensor cameras (except for the Olympus that's mirrorless). I will be doing a separate article on Full Frame vs Crop Sensor vs Mirrorless in the future however this piece is aimed at someone starting out in photography and I do not want to bog you down too much in that debate just now. In my opinion you should just be concerned with picking up a decent camera and getting out shooting because that is the only way you will learn. And of course the internet is a throve of tutorials, tips, tricks etc where you can learn all you need to know. I will be updating this website with short easy tutorials that are not as technical as some you may find but ones I hope will make sense. For lens options- That will be discussed in my next piece. Thanks for reading and I hope this helps. As always feel free to subscribe and share.